Emirates has won the Aviation 100 Middle East & Africa Airline of the Year, awarded by Airline Economics magazine. The award was won based on the airline's financial and revenue per passenger kilometres (RPK) performance, aircraft orders, as well as network and fleet expansion activity. The Aviation 100 awards recognise aviation's most outstanding performers, as well as the most innovative and successful finance and leasing deals, closed in the last 12 months. 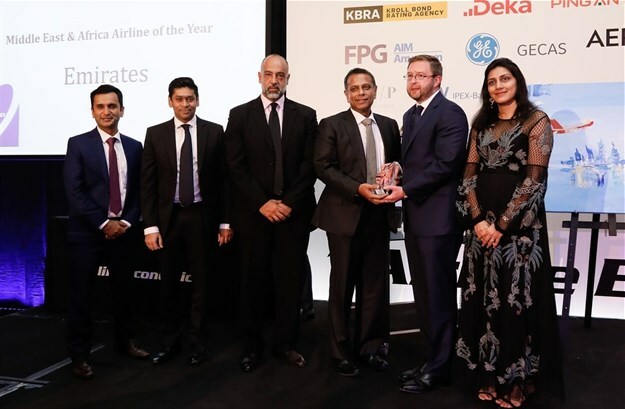 The awards were held during the Airline Economics Growth Frontiers Dubai 2018 conference gala dinner. Emirates and its financing partners also won Deal of the Year for Innovation, which resulted from a leasing transaction of five Airbus A380s. Nirmal Govindadas, senior vice president corporate treasury received both awards on behalf of Emirates earlier this week. In the 2017/18 financial year, Emirates delivered a solid performance, increasing its revenue to AED 92.3bn ($25.2bn), and posting a profit of AED 2.8bn ($762m). The airline carried more than 58 million passengers and 2.6 million tonnes of cargo. In 2017, Emirates also clocked in 289 million scheduled passenger kilometres flown (RPKMs). Emirates has progressively grown its network and today flies to over 160 destinations across 86 countries and territories, in addition to entering into several strategic partnerships, including an extensive codeshare with FlyDubai. Today, the codeshare partnership offers a combined network of over 200 unique destinations, providing more travel opportunities and connections for customers. The airline will remain focused on stimulating customer demand, while delivering a great experience onboard a fleet that is among the youngest in the industry.